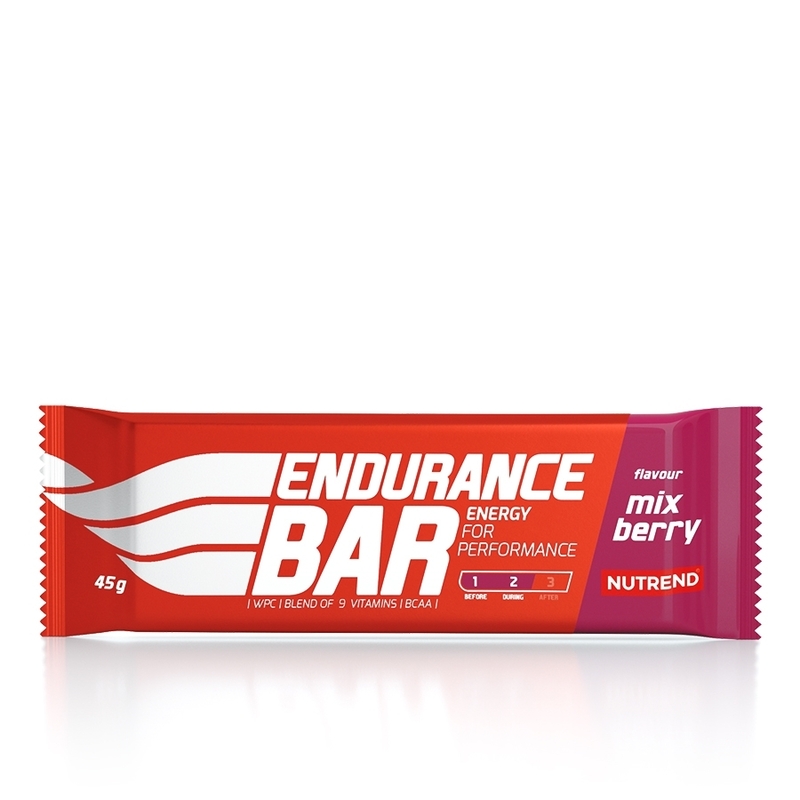 This energy bar mostly contains easily digestible carbohydrates to replenish energy during demanding physical activities. It also offers an easily digestible whey protein, BCAA, and vitamins, and thanks to its unique composition, the bar does not burden the digestive system. ENDURANCE BAR is a nutritionally balanced energy bar for endurance sports like road and mountain cycling, long-distance running, multiple hour-long activities like Ironman contests, but also for long hikes, cross-country skiing, etc. 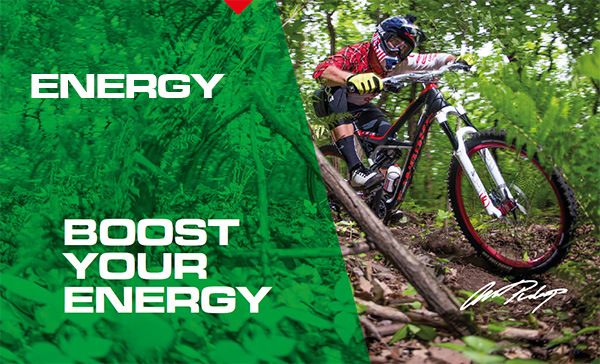 It can be used as an energy source before the activity, but also for gradual dosing during the activity. 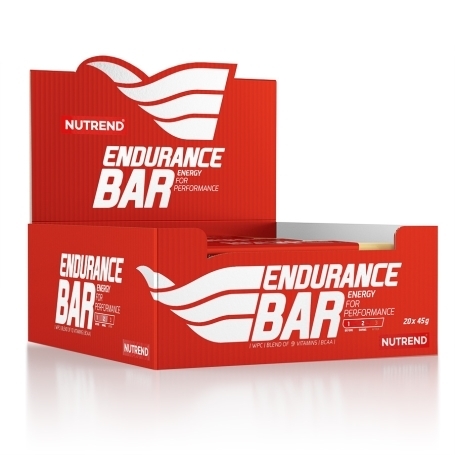 Recommended dosage: 1-2 bars daily. 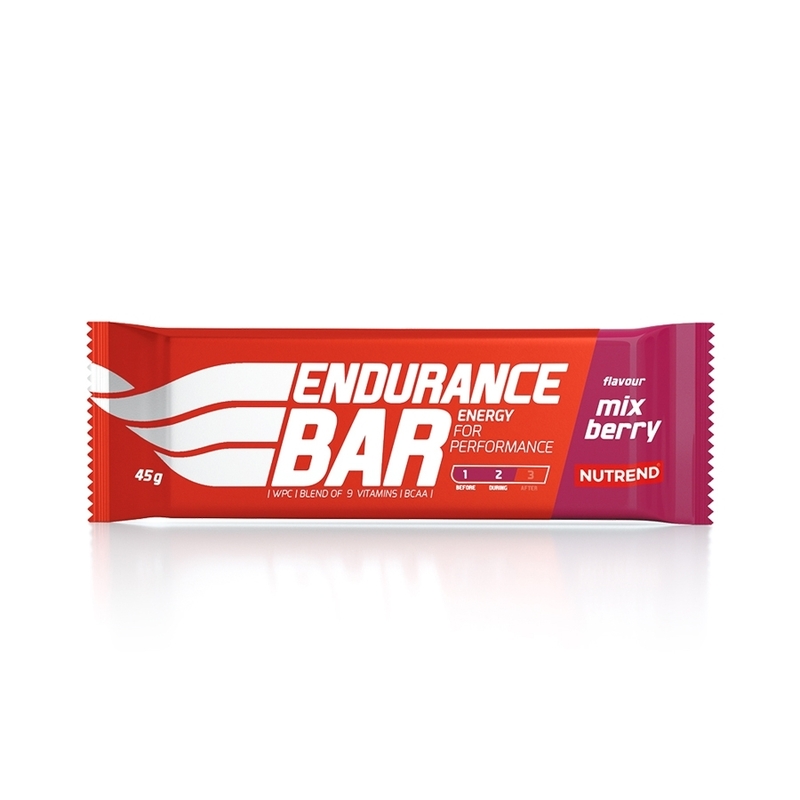 Warning: Bar fortified with vitamins and BCAA.Not suitable for children, pregnant or nursing women. Keep out of reach of children. Store in a dry place below 25 °C. Keep away from frost. Caramel flavour: fructose-glucose syrup, glucose syrup, maltodextrin, 11 % whey protein concentrate, oat bran, rice flour, vanilla-flavoured cream (sugar, palm oil and shea butter, dried whey, dried skimmed milk, emulsifier soy lecithin, flavouring, colouring E 160c), vegetable fat (palm kernel, palm, shea), colouring caramel, emulsifier rapeseed lecithin, humectant glycerin, vitamin premix (DL-α-Tocopherol acetate, nicotinamide, D-calcium pantothenate, pyridoxine hydrochloride, riboflavin, thiamine mononitrate, pteroylmonoglutamic acid, D-biotin, cyanocobalamin), caramel emulsion (flavouring, colouring E 150d), L-leucine, L-isoleucine, L-valine, antioxidant L-ascorbic acid, sodium citrate, potassium gluconate, sodium chloride, magnesium citrate. 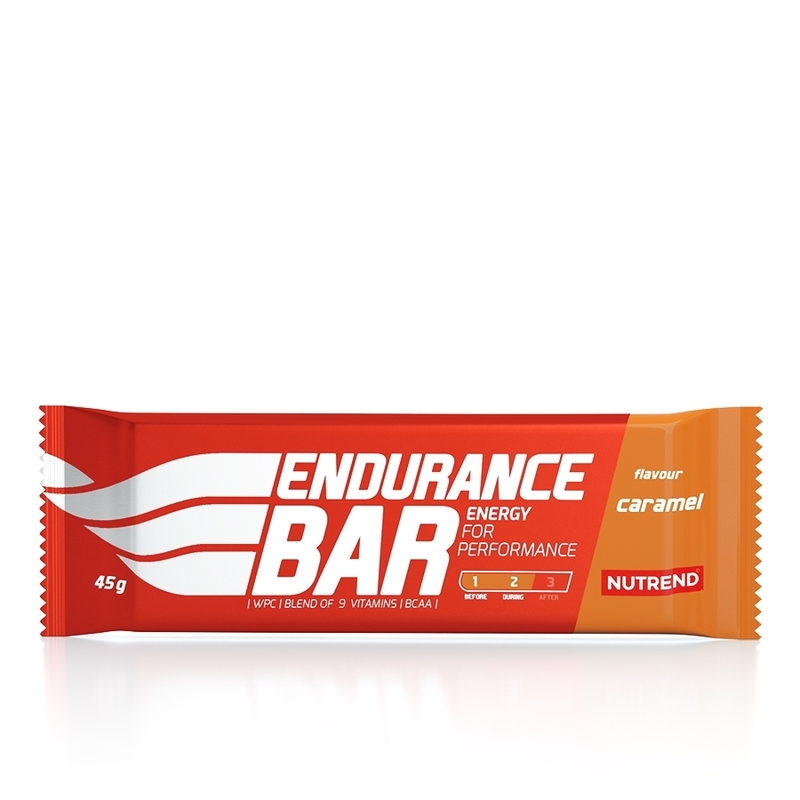 May contain traces of nuts, peanuts and sesame seeds. 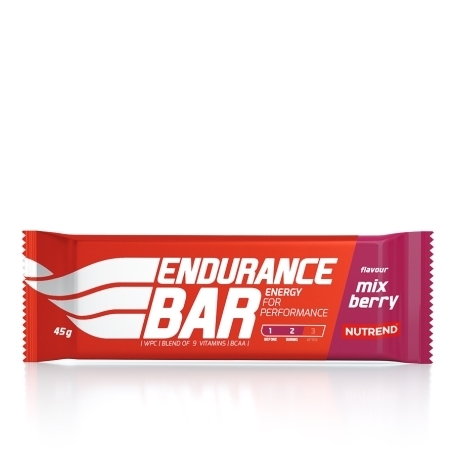 Mix berry flavour: fructose-glucose syrup, glucose syrup, maltodextrin, 11 % dried mixed fruits juice (sugar, fruit content 31 % (raspberry, strawberry, elderberry, blackberry, blueberry), acidity regulator citric acid, flavouring), 10 % whey protein concentrate, oat bran, rice flour, vegetable fat (palm kernel, palm, shea), fructose, humectant glycerin, emulsifier rapeseed lecithin, vitamin premix (DL-α-Tocopherol acetate, nicotinamide, D-calcium pantothenate, pyridoxine hydrochloride, riboflavin, thiamine mononitrate, pteroylmonoglutamic acid, D-biotin, cyanocobalamin), L-leucine, L-isoleucine, L-valine, antioxidant L-ascorbic acid, sodium citrate, potassium gluconate, sodium chloride, magnesium citrate. May contain traces of nuts, peanuts and sesame seeds. acid, D-biotin, cyanocobalamin), L-leucine, L-isoleucine, L-valine, antioxidant L-ascorbic acid, sodium citrate, potassium gluconate, sodium chloride, magnesium citrate. May contain traces of nuts, peanuts and sesame seeds. 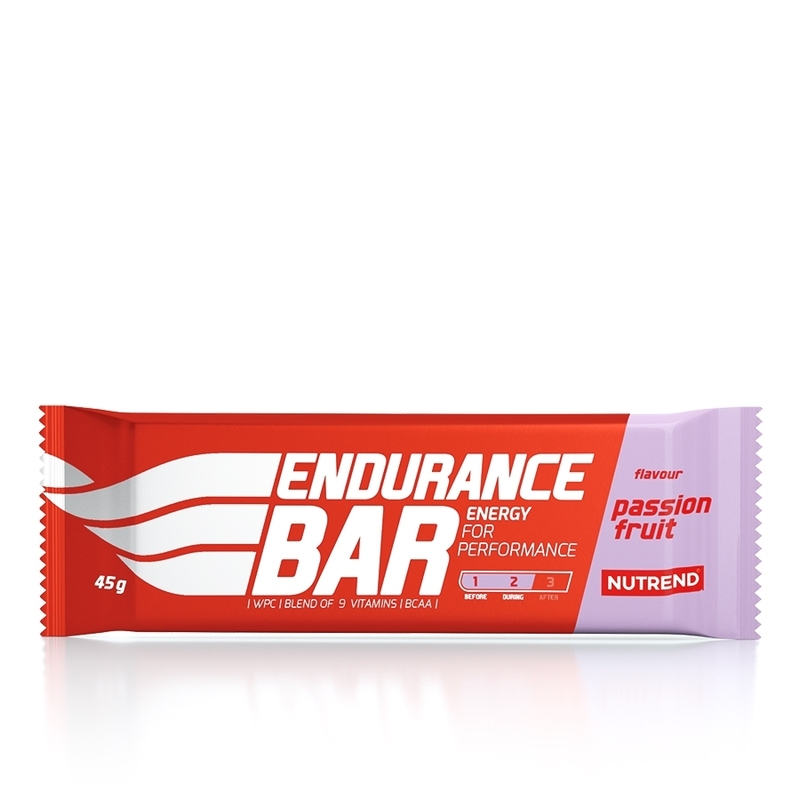 Vanilla flavour: fructose-glucose syrup, glucose syrup, maltodextrin, 11 % whey protein concentrate, oat bran, rice flour, vanilla-flavoured cream (sugar, palm oil and shea butter, dried whey, dried skimmed milk, emulsifier soy lecithin, flavouring, colouring E 160c), vegetable fat (palm kernel, palm, shea), humectant glycerin, emulsifier rapeseed lecithin, vitamin premix (DL-α-Tocopherol acetate, nicotinamide, D-calcium pantothenate, pyridoxine hydrochloride, riboflavin, thiamine mononitrate, pteroylmonoglutamic acid, D-biotin, cyanocobalamin), L-leucine, flavouring, L-isoleucine, L-valine, antioxidant L-ascorbic acid, sodium citrate, potassium gluconate, sodium chloride, magnesium citrate. May contain traces of nuts, peanuts and sesame seeds. The vitamin content of 100 g corresponds to 125 % of the reference intake.